1Take resolution — pixels per inch —into account. When you enlarge an image, one of two things happens: The resolution goes down and the pixel size increases, or the software upsamples the image. Similarly, when you reduce print size, you can retain the current pixel count, which makes the resolution go up and the pixel size shrink; or you can retain the current resolution, in which case, the image-editing software downsamples the image. 2Figure out the maximum size at which you can print your image at a desired resolution. 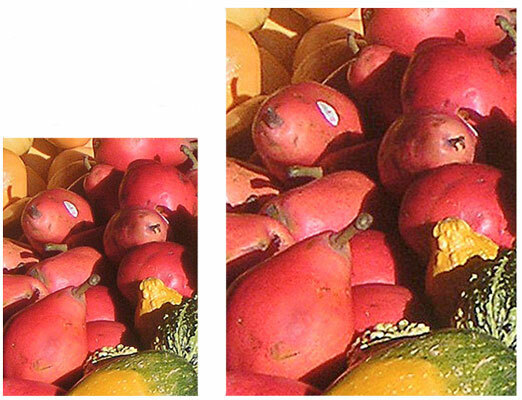 Divide the horizontal pixel count (the number of pixels across) by the desired resolution. The result gives you the maximum print width (in inches). To determine the maximum print height, divide the vertical pixel count by the desired resolution. 3Decide whether size or resolution is most important. 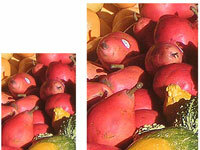 Notice that the small image (left) has a much higher image quality than the large image (right). If you don’t have enough pixels to get both the print size and resolution you want, you have to decide between the two which is more important.